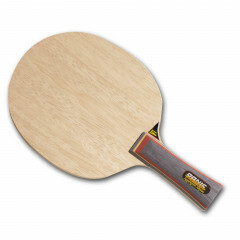 Depending on the rubber you combine this blade with, it is suitable for all modern table tennis strategies where ball control is most important. It provides high acceleration reserves for a fast spin game. Now available in the two SENSO versions: V1= optimum speed V2= optimum control Mikael Appelgren the record European Champion will use a blade APPELGREN ALLPLAY designed according to the SENSO V 1 principles. Donic Blade Appelgren Allplay Senso V1 is beeing added to cart.